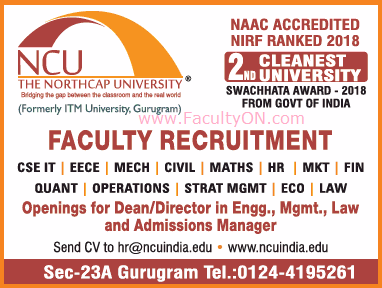 The NorthCap University, Gurugram has advertised for recruitment of Professor / Associate Professor / Assistant Professor jobs vacancies. Interested and eligible job aspirants are requested to apply immediately from 21st November 2018. Check out further more details below. About University : The NorthCap University was founded in 1996, to promote excellence in Technical and Management education by Educate India Society, registered under the Registration of Societies Act of 1860. The University was conceived as Institute of Technology and Management in response to the acute deficiency of centres of higher learning in the country as also, the need to develop relevant human capital to meet the technology and management challenges of the 21st century. As per UGC norms. Ph.D qualification is preferred. How to Apply: Interested and eligible candidates are requested to send application along with CV, copies of certificates and testimonials / PP size photo to the email address provided below. For more details, you may visit the Recruitment section in official website.